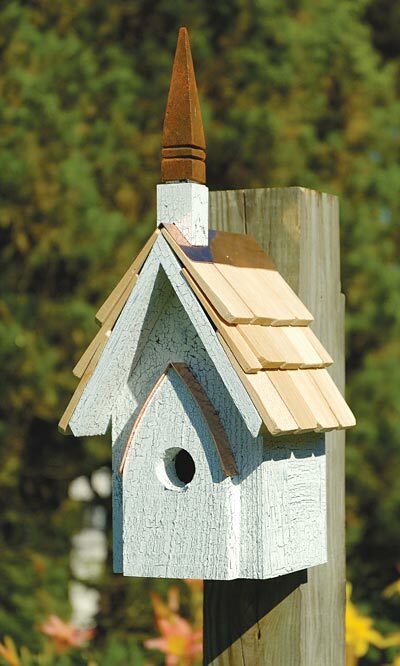 Invite your neighborhood birds to congregate in the Heartwood Classic Chapel Bird House. This charming, church inspired, white crackle painted bird house features a cypress tiled roof and a copper trimmed roof line. The pointed arch doorway is accentuated with a 1" wide shiny copper band and has a 1" diameter entrance hole. A rusted cast iron steeple stands atop a white crackle finish steeple base. A sturdy, metal hanger is screwed into the back of this birdhouse for secure attachment to a wall or post. A 3" diameter copper plate covers a 2" hole on the back of this feeder for convenient seasonal cleaning and a 0.25" opening in the bottom enables ventilation and drainage. Add the Classic Chapel Bird House to your birding sanctuary. Made in the USA.